1. One of the attributes or characteristics in Aristotelian logic, including designations of genus, species, etc. : "The logics professor at the university, urged her students to understand the predicables of Aristotelian logic." 2. Something which can be stated or that can be said about someone or something: "The predicables that Aunt Hattie made about the farm were accurate because she had grown up in an agricultural area." 3. 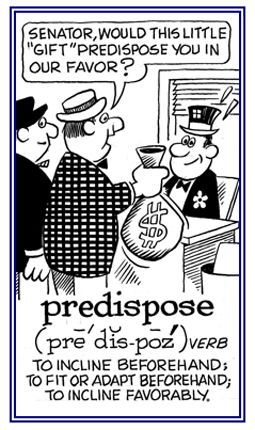 Etymology: from medieval Latin praedicabilis, "able to be affirmed: from Latin praedicare, "to declare"; from prae-, "beforehand" + dicare, "to make known". 1. That part of a sentence or clause that has a verb which says something about the subject or subjects: An example of a predicate is "went home" in the sentence, "Jack and Jill went home". 2. 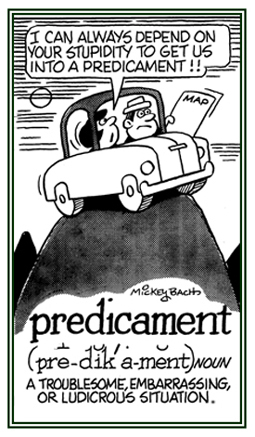 Etymology: from Latin, praedicatum, "something declared" and praedicatus,"declared, proclaimed"; from the verb praedicare; from prae, "beforehand" + dicare, "to make known". A word that determines what makes up one or the main parts of a sentence: In formal terms, a verb is the predicator, because its function is to state something about the subject. To foretell, to prophesy, or to announce an event, etc. before it happens: "Unemployment data is predicted to be higher next month." "Weather forecasters are said to be in the only profession that can predict events and be wrong so often and still stay in business." 1. Happening or turning out in the way that is anticipated or probable: "With so much financial backing by special interests, the predictable results of the politician's election were expected." 2. Behaving in a way that is likely to be true: "Nancy said she knew that her predictable father would say she couldn't go to the dance and stay until midnight." Able to be anticipated or expected: "The Senator made a predictably hostile interruption when the man started to criticize him about his political position." 1. The action of foretelling future events; also, an instance of this, a prophecy: "The gossipy ladies made a prediction that Susan, the orphan daughter of their friend, would marry within the year." 2. A statement that is made before something actually happens: "The newspaper published a prediction that gold would be found on the remote island and it proved to be true." A person who, or that which, foretells or indicates that something is going to happen before it actually takes place: "Quite often weather forecasters are accurate predictors." The partial artificial digestion of food before its ingestion. 1. A special liking or preference for something: Jim's son and daughter each had a predilection for adventure stories. 2. A tendency to think favorably of something in particular; a partiality: Kate has a predilection for rich desserts after each lunch and dinner. 3. 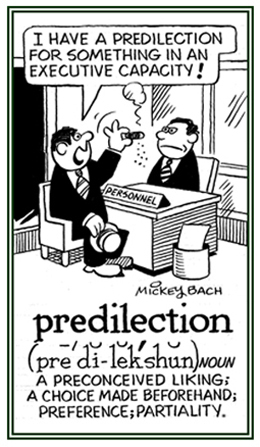 Etymology: from Latin praedilectus, prediligere, "to prefer before others"; from prae-, "before" + diligere, "to choose, to love"; also from French predilection, "before others." Based on diligent which came from dis-, "apart" + legere, "to choose". 1. To cause or to make someone develop a particular attitude: By reading to her children at a young age, Marie was hoping to predispose them toward the love of books and reading. If a judge is predisposed in favor of a litigant, he has an inclination in that person's favor before the trial begins. 2. To be susceptible to an unhealthy condition or disease: Karla's medical history suggested that she was predisposed to bronchial infections during the winter. © ALL rights are reserved. A condition or state that suggests susceptibility or inclination towards something; such as, a mood or a health issue: Randy had a predisposition of developing a skin rash because of heat or overexposure to the sun as a child. Based on Hope's childhood experiences, it would seem she has a predisposition to laughter and fun. Brian had a latent predisposition to a disease which could be activated by stress. The divining of events beforehand. Showing page 7 out of 19 pages of 275 main-word entries or main-word-entry groups.